Description of Webinar: This presentation will provide training on evidence gathering during the life-cycle of Discovery and Due-Diligence. 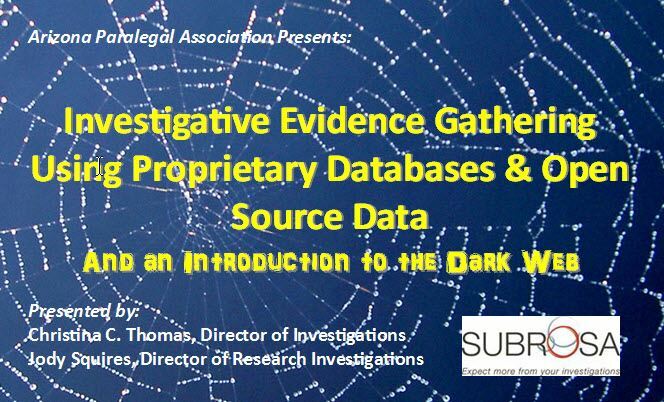 The Presentation will focus on the underlying methodologies of the investigative research process, step-by-step training on finding and using innovative research tools available through Legal Databases, the Deep Web and Social Media. Introduction to the Dark Web - how it works and it’s uses from good to evil. This webinar qualifies for 1 hour of CLE. LAST DAY TO REGISTER: Monday, February 6th!